We want to use this opportunity to notify the public that Muhammadu Buhari’s handlers have once again failed woefully in their amateurish hatchet jobs. There is no iota of truth in all the stories being circulated on the internet safe for the authenticated pictures and videos in which our leader appeared. Our position is that we shall allow these enemies of Biafra to vent and deflate....then we shall bury them with the truth. Please disregard all publications not from radio biafra, IPOB leadership or from authorised ipob spokespersons or IPOB media and publicity Secretary. 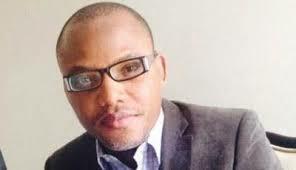 Biafra Restoration under the supreme leadership of Mazi Nnamdi Kanu is irreversible, unassailable and insurmountable. Furthermore, the heart of this project MUST Not be allowed to see corruption. While we pay courtesy call to some individuals and groups, we want to make bold to say that such should not be taken for granted.....this is a very direct warning to those who want to use the opportunity for their own selfish political advantage. They know that there is a gagging order restraining our leader from speaking for now to the press, remove this order and the zoo will sink overnight. Be rest assured that we are doing something about it.Please, be advised that IPOB can never negotiate the freedom of Biafran people for money. This platform cannot be MONITISED. Millions have sacrificed their lives for goodness sake.Be guided accordingly Biafrans, friends of Biafra and humanity at large. Remain resolute, remain courageous, remain focused never set your eyes off the ball!